Yes, Halloween is right around the corner, and so is my very timely departure to Houston! This is a crazy week for me with numerous things I hope to get done, and then there are 1-1/2 days with kids not in school and 3 conferences to attend. I probably should just cut my To-Do list in half before I start it. So, rather than thinking I might blog later in the week, here is a Halloween quilt I did early in September. The client wanted light stitching so that the quilt remains soft and cuddly. It is stitched in Glide -- a few colors. The candy-corns (which are really one of the more gross candies) were her favorites. I got her consent to add a spider to the quilt. I think she was hesitant, but did give me the go ahead. I honestly loathe these creatures, but a lime-green spider hanging from a web seemed OK for a Halloween quilt. When the fabrics on the front are so heavily printed, it gets hard to select quilting motifs that really show. There's bats and webs, and checks...much print! Here's a peek from the backside. I like to quilt pieces like this because they quilt up relatively quickly, and allow me to just go from one row to the next being creative. This is all freehanded, with a little ruler-work thrown in. Yesterday was a day of small quilts. These two were brought to me by the same local client. 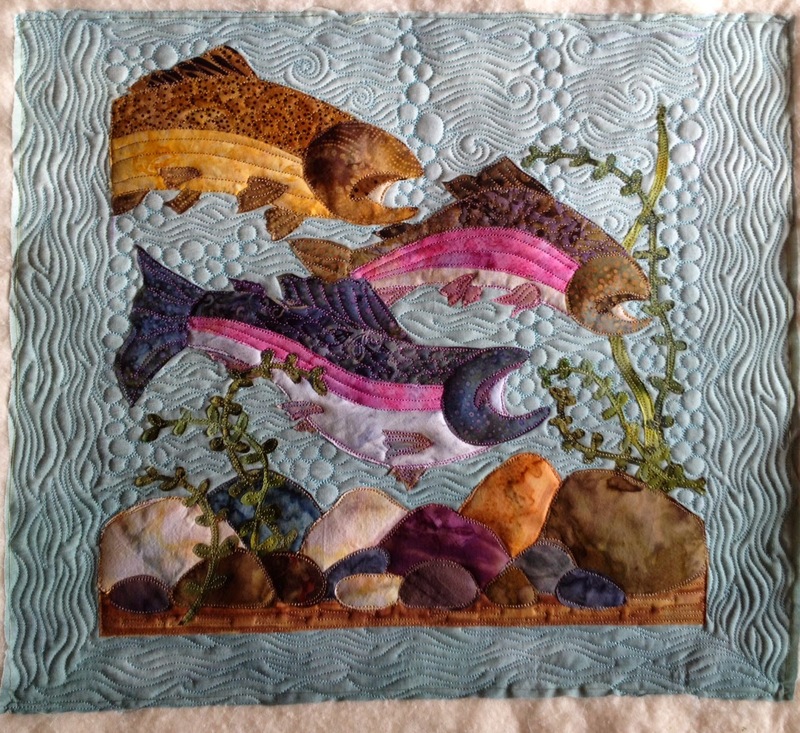 I did one of these fish quilts for her last year, only the larger version. 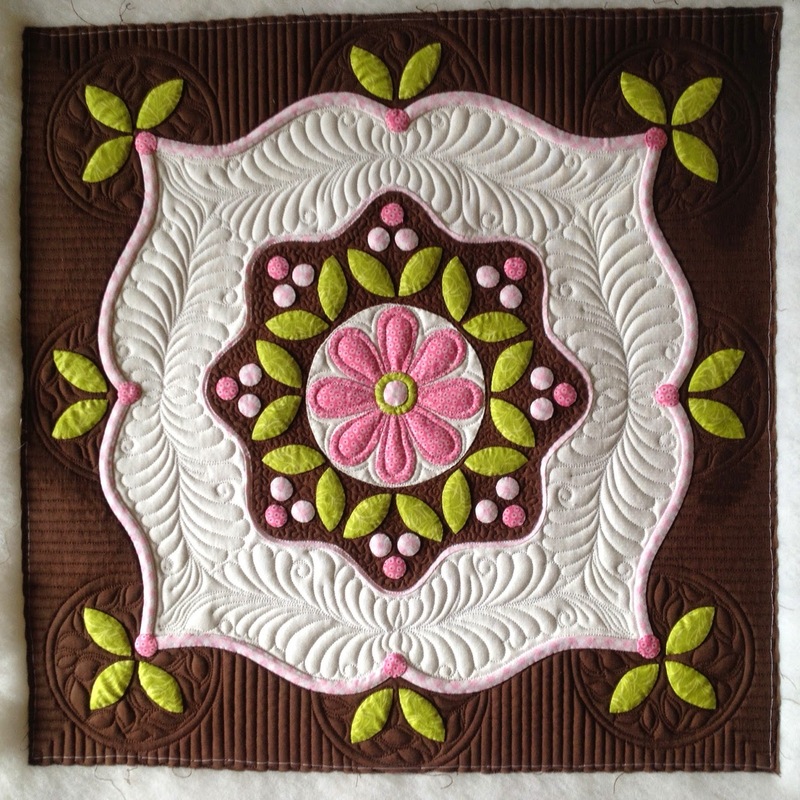 This was a fun and quick 13" square! The only real challenge is that there are many threads needed, so I am constantly changing thread color, and it is raw edge appliqued. She brings them to me just ironed, without any stitching around the pieces, so they are very delicate at the edges. She will do the fish eyes - hence the expressionless swimmers. Her second quilt is this one...and I just LOVE it. Really wish I could keep this one. The applique is all needle-turn and is very well done. I chose a white So Fine and dark brown Glide to let it shine. I used 2 batts - a thin cotton and a piece of what I think is polydown (yes, I have loads of scraps for the pick-n-choose). I wanted the appliques to puff, and a single cotton batting does not accomplish that. 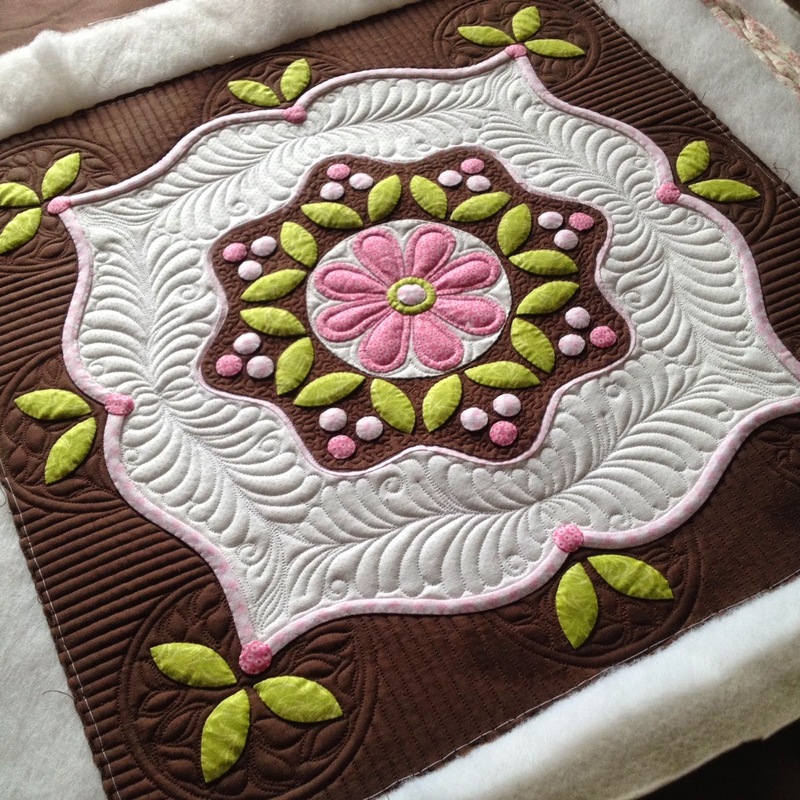 The white area, where the quilting shows easily, needed pretty feathers, leaves and curls. In the brown, I wanted to break up the border just a little bit. The circles do just that - nothing overly complicated because it is a narrow space, but just enough variety. In between finishing at least one client quilt each day, I am working on way too many other things (besides 2 unfinished show quilts, a magazine article, and prepping for teaching in April). This is a piecing project I have started whose mess is beginning to consume my studio. I have some of the sections put together, and am currently working on the center, which has a little handwork. The brighter fabrics are Moda Weave, and I simply love this line of fabric. It is a great weight and has wonderful sheen for a cotton. Teaching? Did you catch that I am teaching at MQX in April? It is official. I hope those of you coming to the show will check out my class listings here! I've got some work to do this winter to get my samples and notes all congealed! This quilt was finished over a week ago. It is nearly home by now to it's Washington owner and client Sherrie. This is a kit she purchased while in Paducah. It's all hand-dyes, and in person is so much prettier. Somehow, the yellow comes across overly sunny in the photos. Since the leaves outside my window are sadly turning already, I figure it is an appropriate quilt to show. Sorry guys, it is not that the colors are not pretty, but I am a summer person, loving the heat and truly hating to be cold. Snow is not my thing. Designing for this type quilt is very challenging. 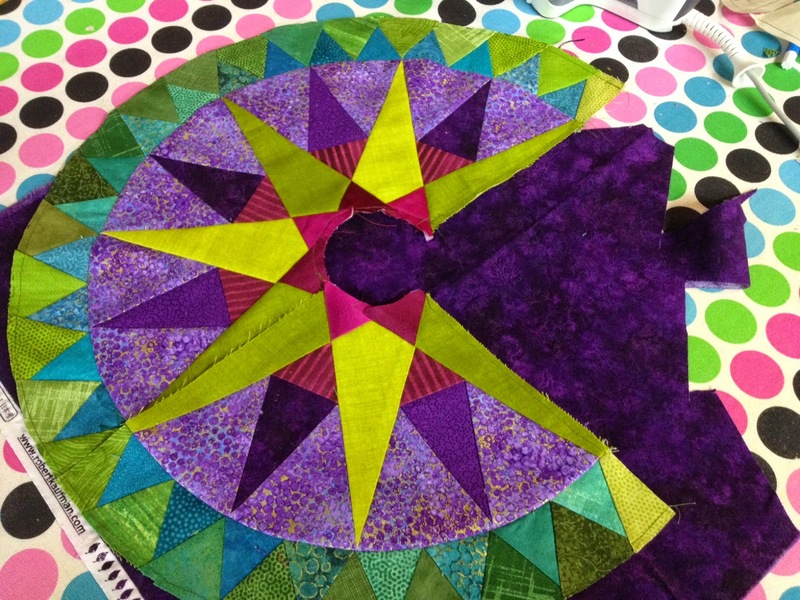 It forces my brain to think about different layouts, where you would have a visual focal point, and how to make the eye move about the quilt. 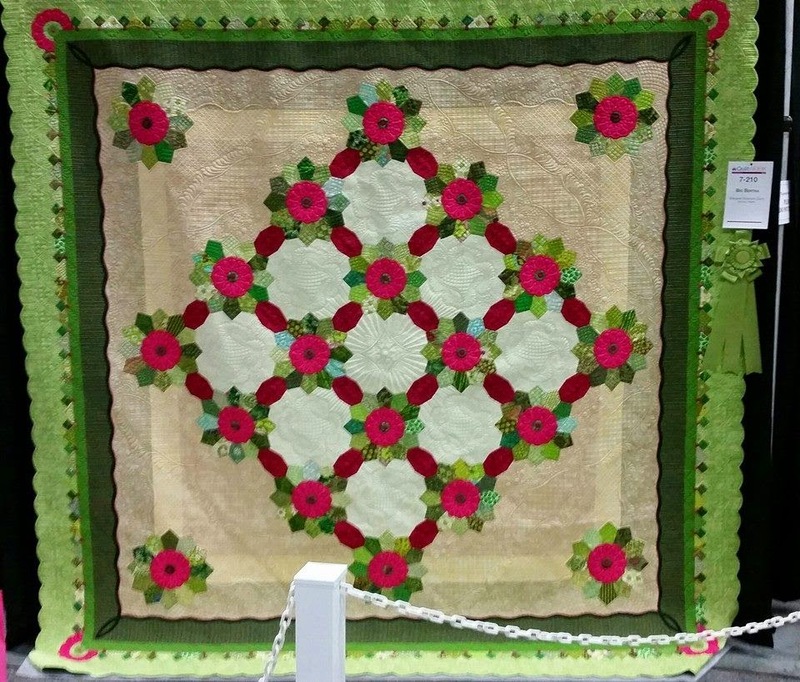 Block quilts are much simpler from that regard, as well as from the standpoint of creating secondary designs. Coincidentally, the client asked for secondary patterns, referencing my Zen Garden quilt (shown at the bottom), but in all honesty, it's not feasible for this type layout. I had to find other ways and places to put design into the quilt. The most obvious place is this honking wide border! It is doubly effective that it is a pale shade too, because that will show the design easily. I have combined a detailed cathedral window into the border, placing 1/2" cross-hatch and raying lines into the spaces. Feathers fill the smaller triangles. Now I know that this border has little to nothing to do with falling leaves, but I believe that the unstructured nature of this quilt can handle a very structured border. It helps to ground it. The body of this quilt is huge. The overall size is 82"x102". It is impeccably pieced, but color is the only connecting feature. For my design, I have created cascading, and swirling feathers (which are actually made up of leaves). These feathers are very much like what I used on my Shenandoah Falling show quilt. In fact, this is similar to a huge version of that, in a way. The blank space around these has some free-placed leaves, and LOTS of fillers. I made 2 leaf templates out of a used cereal box - one is an oak, and the other a pseudo maple. They were traced with chalk. Nothing had been prewashed, so I was not about to have bleeding. My water-soluble pens were out. The cascading leaves and free-placed leaves were stitched in a Rainbows thread. It was quite the pain in the neck to use, as it sometimes is, but this was a perfect variegated thread color(s) to use. I outlined the leaf twice to make it more visible. There is a string of large-ish pebbles from the stems of these free-placed leaves to help them to show. I envisioned this exaggerating the look of falling. This quilt has just one wool batt. Background quilting is done in three shades of 50wt So Fine thread. I chose a duller, non-shiny thread so as to only see the texture. Each of the three colors of fill, has its own filler too. The gold thread does this free-feather fill. The aqua/teal thread does a leafy filler (all sections have these occasional sections of parallel lines thrown in, just because). The fuscia thread has this organic flame-spiral thingy that came from a Judy Woodworth class some years back. All filler designs fill nicely into cracks and seem to fit the theme of the quilt. Stitching this detailed border around all these leaves was as hard as it looks!...and time consuming. In the meantime, I will leave you with a couple images sent to me from the AQS Des Moines show, running right now. My quilts have done very well, again. Big Bertha is sporting what may be my favorite ribbon of all time - lime green! It is for best Machine Quilting, also for this business I am in, a treat to receive. It is like they chose that ribbon just for this quilt! 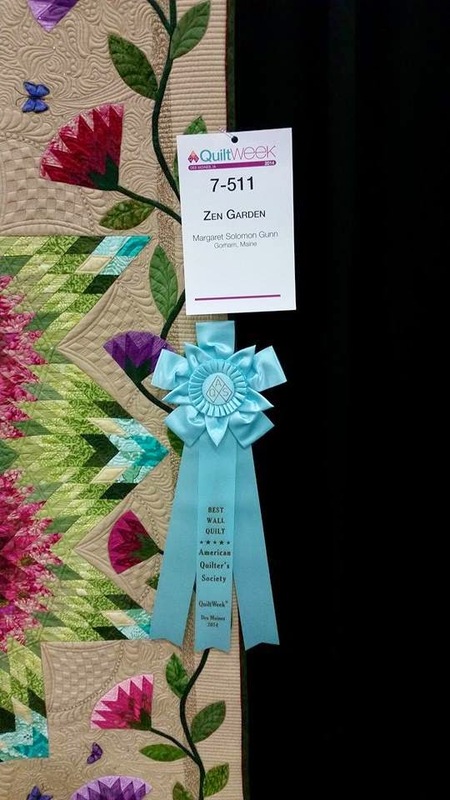 And here's the side of Zen Garden, which received best Wall Quilt, with yet another lovely seemingly color-coordinated ribbon. Both quilts will be coming home for a couple months. They have been gone since July, entrusted to AQS to keep safe. Zen cannot go to any more AQS shows, but Bertha has one in January. Hard to fathom that these two dames will be soon in retirement. There are 3 weeks until I leave for Houston. Would love to meet up with folks if you are there too - let me know.